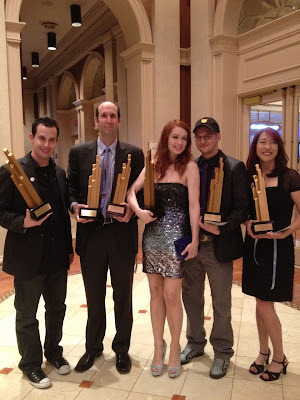 Photo 1: The year started off pretty strong with me and my friends winning a ton of categories at the IAWTV Awards. I was the Academy's first multi-catagory winner, honored with best Best Production Design and Best Make-up FX awards for Dragon Age: Redemption . 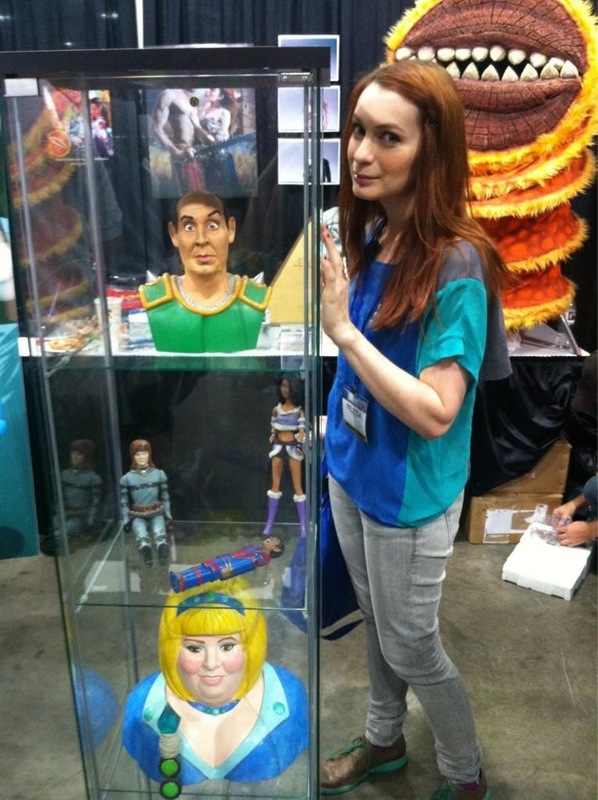 Of course, being the first is the ONLY thing that kept me in step with this amazing group, as all of us ended up winning multiple awards, and naturally the amazing Felicia Day needed help carrying her 4 trophies home! Photo 2: I'm thrilled to have been nominated for the 2013 IAWTV Awards, this time for Best Costume Design for my work on Save The Supers. 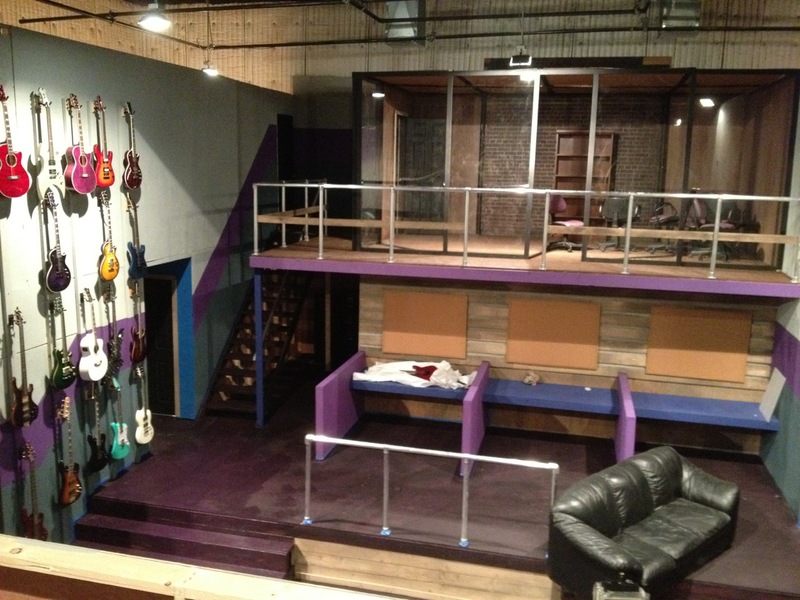 I designed the entire show, including the sets and props. Sandeep Parikh wrote and directed this "Super Friends! " 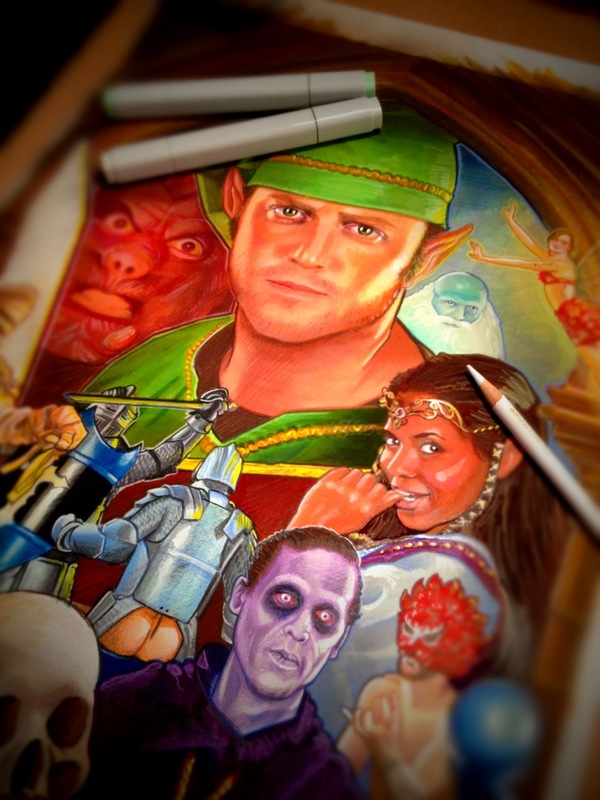 parody, and it was awesome to collaborate with him again this year. The show also gave me another opportunity to costume Felicia, this time as a 60's style comic book villain. Photo 3: As in the past 4 years, 2012 was filled with Felicia Day driven projects. Some were direct calls from her where we worked together on something, other times one of us would show up on set and be surprised the other was there. But either way, looking back on the year, it seems like so many cool things have come from us working together. Which is good, since Felicia is always fun to work with! 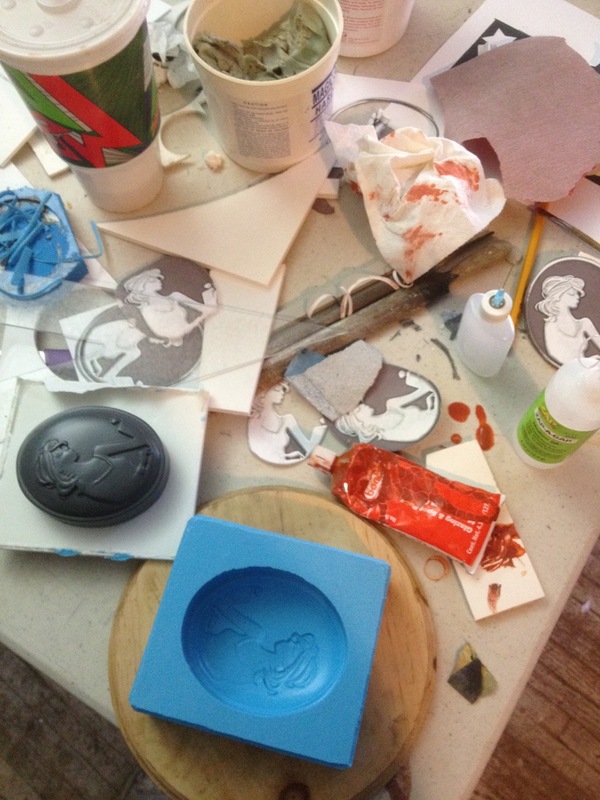 Above, you can see the soap mold I made in the form of the logo for her show, THE FLOG. Photo 4: Teal Shear's show, My Gimpy Life, featured Felicia as an actress who liked to read romance novels while in casting agent's waiting rooms. So, pretty much, she was playing herself. The script called for a sci-fi/romance hybrid called Blind Desire, with a dust jacket that featured a blind goddess being seduced by a cat man. Teal called and asked if I would do the cover, much in the style I did The Guild's Highland Sextasy painting. I asked Milynn Sarley of Team Unicorn to be my model, as she is as close to a goddess as you can get. It's acrylic on canvas, with as many innuendos as I could fit in a 24x36 inch space! 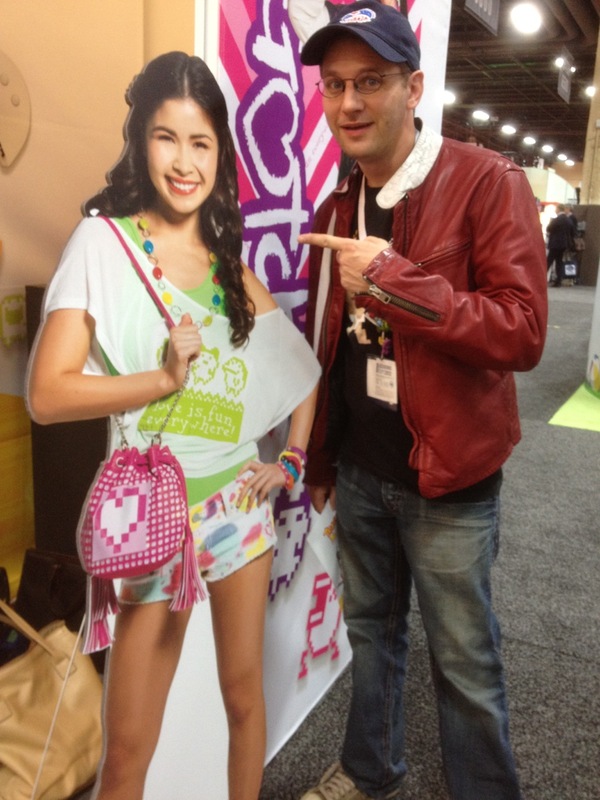 Photo 5: This year also brought us the launch of Felicia's YouTube channel, Geek & Sundry. I weaved in and out of almost every project, designing logos, providing props, whatever I could do to help. G&S partner and producer Kim Evey developed the WRITTEN BY A KID series, and I was lucky enough to be picked to helm an episode. I designed, directed, and puppeteered Ginger Potato, about a gingerbread man who can't catch a break, and I believe it is my favorite project of 2012. 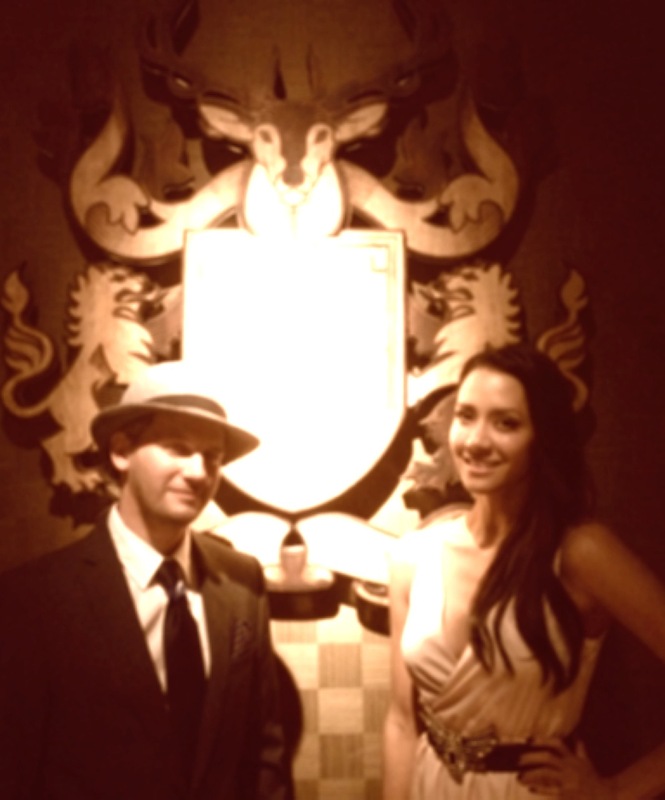 Photo 6: And I cannot forget to mention The Guild . Season 6 had some of the biggest design challenges yet, with an underwater world, and giant props like this bronze dragon statue that Jeff Lewis had to camp out on for days of filming! 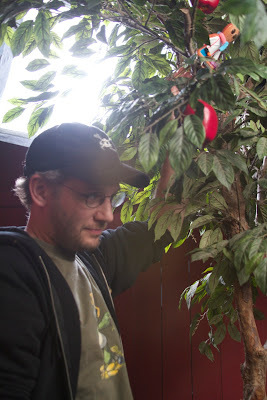 Photo 7: One of my favorite things about the web world is all of the cross-pollination of cast and crew. We all end up working together on all of these different ventures, so it really starts to feel like family. Jeff Lewis has his own show, the award winning Jeff Lewis 5-minute comedy hour, directed by The Guild's Sean Becker. Those guys asked me is I would design some of the more daring episodes, involving sci-fi and fantasy themes. I even built them a hospital room when finding a location was problematic. That was the same episode I on which I worked with Doug Jones again. 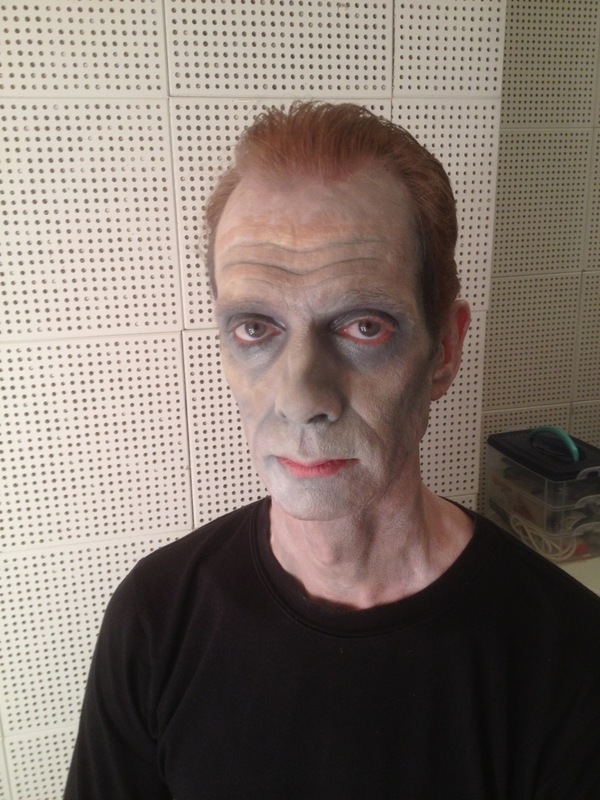 He may not look very happy here, but he was actually thrilled that this one project we did together in 2012 only required some minor face painting, as opposed to the intense full body prosthetics I had to put him in for the 5 projects we did together in 2011! Photo 8: There are actually too many web shows to mention if I want to finish this blog before 2014, but I will definitely include a few more of the key ones. The Fine Bro's My Music is making a lot of waves on the internet, including a whopping 9 Streamy nominations! 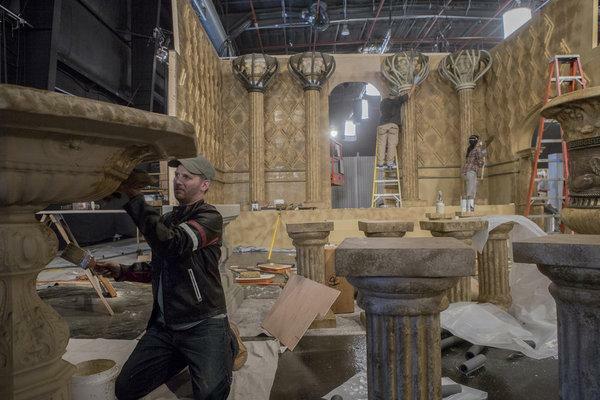 I'm glad one of those is mine for Best Design, since we worked hard to build what I am pretty sure is the largest set ever build from the ground up for a web series. Photo 9: The show centers around the crazy characters in an A&R company, each representing a different genre of music. But in a way, the office where they work is almost a central character in and of itself. An empty sound stage was converted into a 6000 square foot, 2 story set to accommodate the web series even the major networks would consider ambitious! Photo 10: Another great series was HUSBANDS, penned by Jane Espenson and Brad Bell. I designed season 1 in 2011, and was happy to return. I love everything the show stands for, and I think its some of the best writing on the web. This season, things were bigger and better, which usually means more work for the art department! The producers found a huge house in the Hollywood Hills to shoot in, but so much of it was bare. 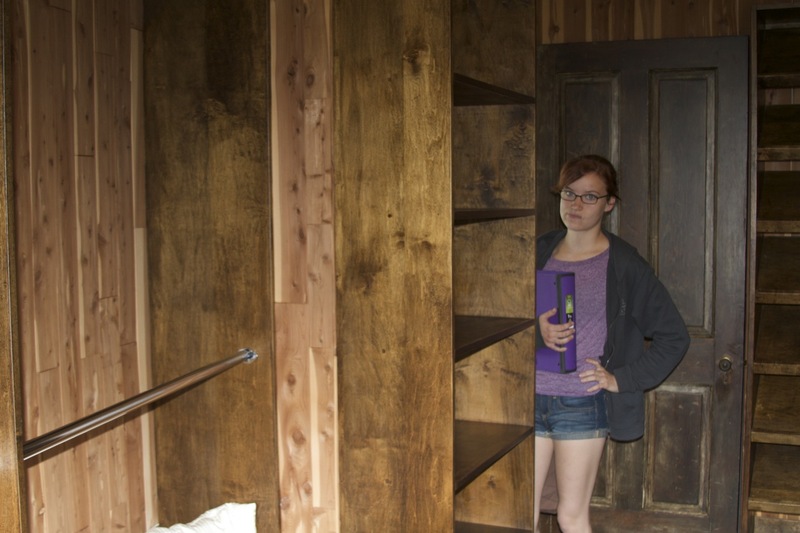 Like this walk in closet. that we had to fill with stylish garments. On a non-existent budget. I think Red5's face says it all! 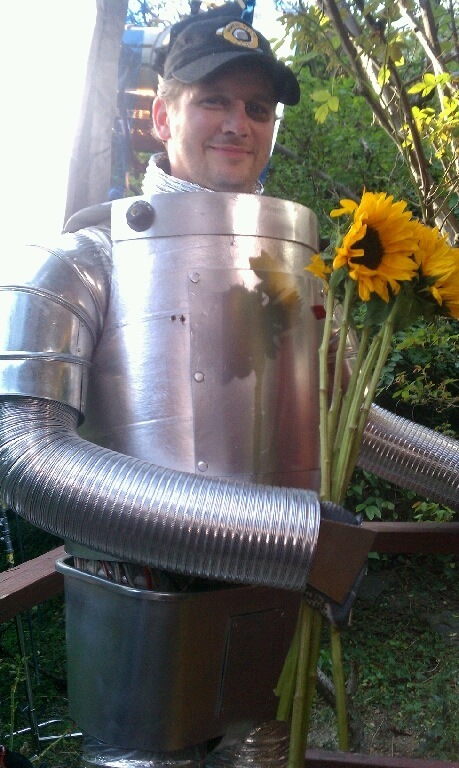 But we pulled it off, and Team Husbands rose above all obstacles to bring another great season of the show to the web! Photo 11: Machinima was on the rise this year, giving all of their shows a make-over. And I got to do most of the making-over! 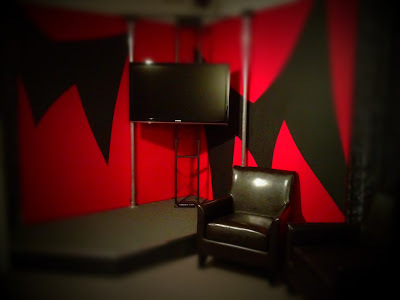 I designed 6 sets for them in all, including the mail room for Respawn: Inbox and this talk show set for Inside Gaming Daily. Photo 12: The internet and "main stream media" are still considered worlds apart, but it is becoming more common to see huge movies and television shows have splinter versions on the web. There are also occasions when original web content makes its way to other media such as DVD. Just in time for Christmas,The Legend of Neil did just that! I had a blast designing season 3 of this break-out series, and it was a privilege to do the art for the dvd cover. And don't forget to watch the special features. I'm sure I'm in there showing you how to make something! Photo 13: I didn't get to design any video games like I did in 2011, but I did work on a bunch of commercials for them! Probably the most popular of all was the live action spot for Borderlands 2 . My team stayed up for 72 hours straight to deliver 12 masks, 4 helmets, and a loot crate! But it was worth it. I don't think any other project has gotten as much response! 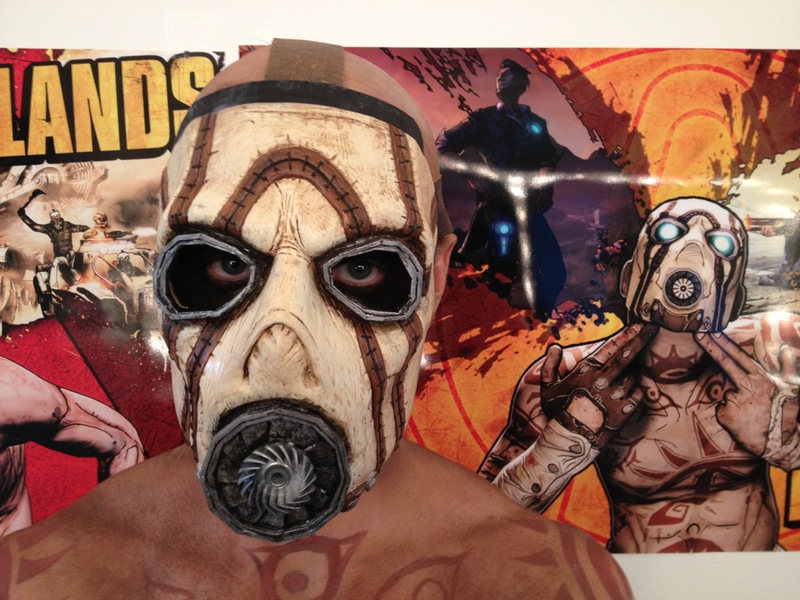 It seems everybody wants a bandit mask. Do you? Photo 14: Thinking back on the year, I recall many of the all-nighters being for video game commercials. After months of bidding and designing, I ended up with only a weekend to create the 7 trophies featured in the Wii Sports commercials. Photo 15: In hind sight, a weekend seems like a luxury compared to the handful of hours I was given to build this robot costume. It was for a smokeless cigarette commercial in India, and it happened so fast we didn't even have time to cast an actor. So I just made it to fit me! I put it together from stuff laying around the shop, and didn't worry about making it comfortable since I would only have to wear it for a few hours. Or so I thought. The client loved the spot and order a whole series, so I ended up becoming a robot multiple times over the year, each shoot longer and more complicated than the next! But, hey, they brought me flowers! Photo 16: I did a lot of television work this year, too. One of my favorites was Happy Endings , starring Damon Wayans. Jr. Every time the writers dream up a crazy prop, I get a phone call. 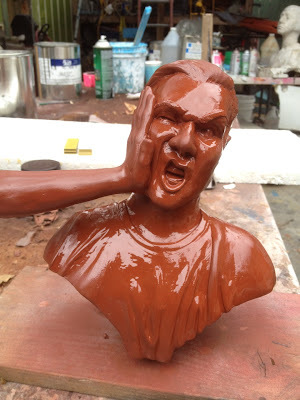 And with each call, the props get crazier and more challenging. Which is awesome! I feel like I did something for almost every episode this season, but I can only show you the ones that have aired so far! You may recognize Sinbrad here, but keep watching the show for more! Photo 17: The script for the episode "Sabado Free-Gante" called for "indestructible piniatas", so although they look fragile on the outside, these donkey actually have welded steel skeletons and super dense polyurethane skin! Photo 18: I love being part of Christmas episodes! 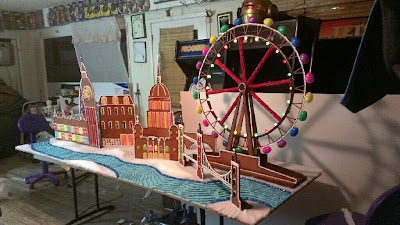 Red5 and I built this gingerbread version of London for Elisha Cuthbert's shop. Anthony Thompson even made the candy eggs on the Ferris wheel light up! 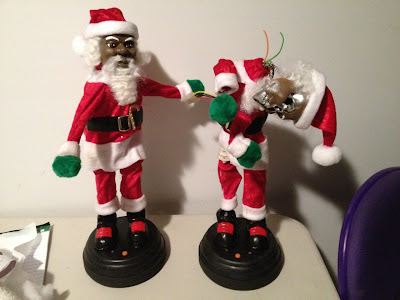 Photo 19: I heard the producers where thrilled that some of the props got so much feedback from the fans, like my Hip Hop Santa. I had to make multiple versions of him, including a stunt version for Damon to throw off the balcony, and the terminator version you can see on the right. 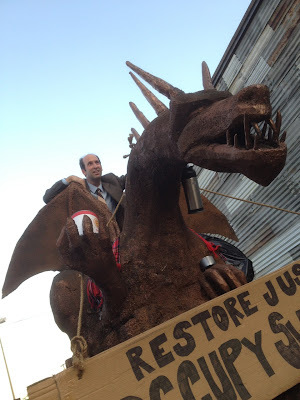 This prop was ultimately cut from the episode. Photo 20: Sometime my presence on a television show is very subtle. 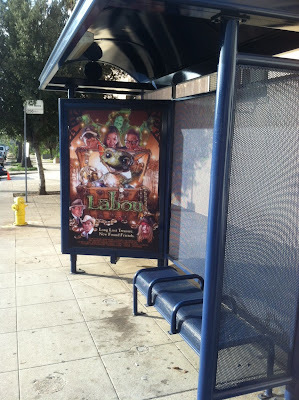 Like this bus stop poster that was featured on Justified . My buddy Dave Blass put it there. 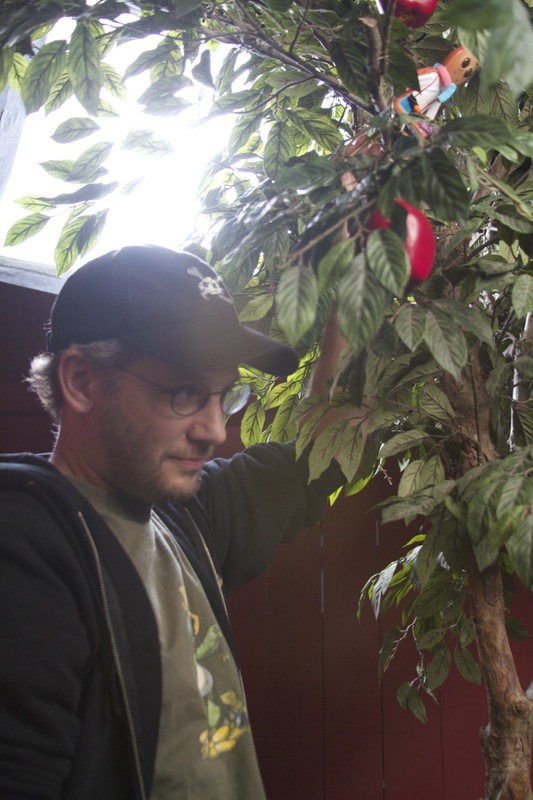 2012 brought him an Emmy Nomination for his design work on Justified. Dave and I have worked together for decades, since the Corman years, so I could not be more proud of him. Next stop: Oscar! Photo 21: Of course, there are other times when it's pretty obvious I'm working on a TV show. Like, when I'm working ON a TV show! I took the plunge this year and stepped IN FRONT of the camera, for real this time, not a cameo or anything. Luckily, it was a reality show, so you didn't have to suffer through me acting! Syfy Channel's HOT SET exposes what goes into creating movie sets, much in the way that it's producers showed you the wonder of make-up fx through Face Off . 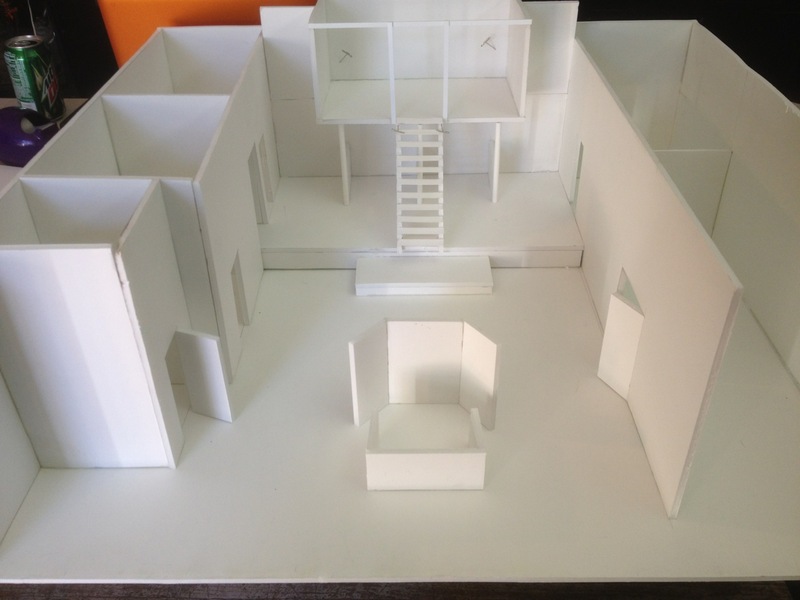 Myself and a competitor had 3 days to design and complete a film set based on a specific theme. We were each allowed to bring 2 team members. I had my art director, Red5, and Amish, my concept illustrator. The winners got $10,000. I won't spoil the rest. You should just watch it! Photo 22: Wil Wheaton had a milestone birthday, 20 or 30 or something, and there was a huge party. 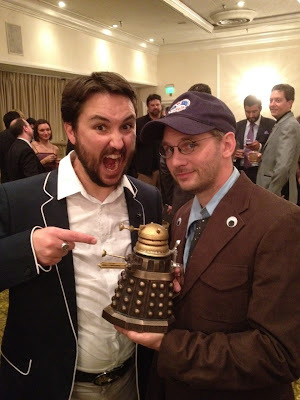 Kim Evey came up with the perfect gift, combining Wil's 2 favorite things: Doctor Who and beer! She was searching the internet for an idea, and found art of a Dalek stein, accompanied by an endless forum of fans who wished it was a real thing. So she asked me is I cold make it a real thing. And I did. That's Wil's seal of approval face. Photo 23: My birthday was much more low key. 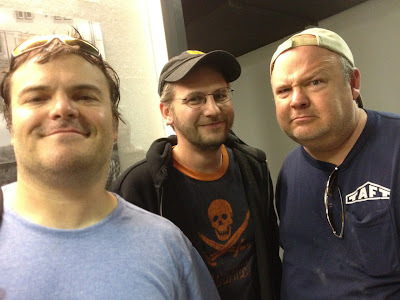 I spent it with Tenacious D . We filmed some stuff. Photo 24: 2012 was the year I achieved many life long goals, too. Growing up as a kid in Jersey, I used to paint heavy metal album covers on the backs of jean jackets to earn extra cash for Star Wars figures and stuff. I dreamed of the day I would be the one painting an actual album cover. I've painted a bunch over the years, but never for a major, classic metal band. Well, I almost got my shot this year. The German band Accept asked me to paint them a cover, and they had a really great concept. I did a ton of comps, but unfortunately, the label rejected everything, including the concept. They ended up just using their logo. 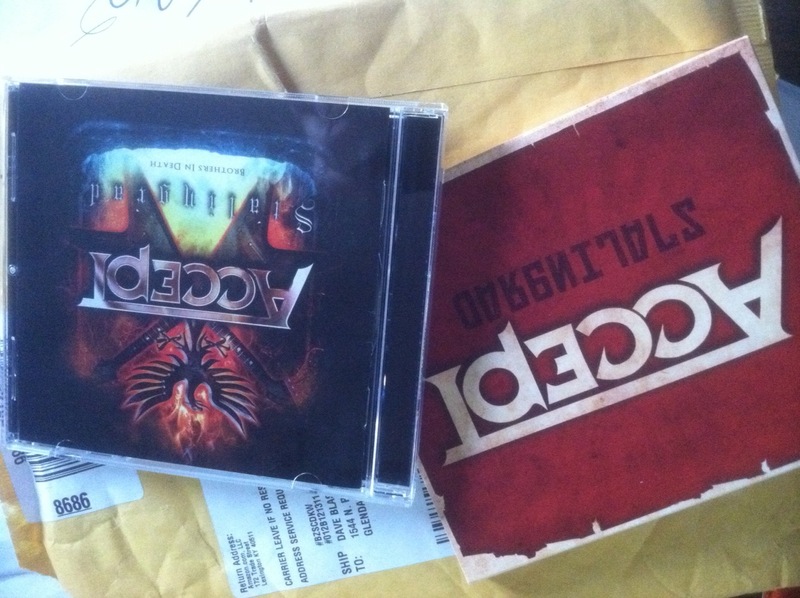 The band, however, loved the art, and gave me a special thanks inside the CD and LP covers. All those years of studying the album covers, wondering who those people were in "The Band wishes to thank" section, and now I'm finally one of them! Photo 25: I also had my first museum exhibition year. I designed and sculpted a series of armor for endangered marine life to help the Surfrider Foundation promote environmental awareness. 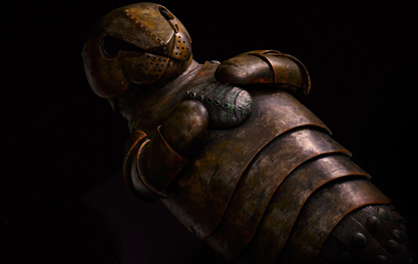 The life-sized sculptures will be traveling around the country, where you will be able to see them at both museums and aquariums. The exhibit is entitled, "They cannot protect themselves", and through this art I wanted to express that we as humans always find a way to shield ourselves from the harm we create, but there are so many other creatures on this Earth that cannot create a barrier against our actions. Photo 26: I've actually been spending a lot of time thinking about the environment and our impact on it. I'm not going to turn into some preach activist or start chaining myself to trees, but you have to be blind to not see how our progressive society is impacting the planet. And I'm just as guilty of it as anyone else. The amount of chemicals and raw materials the entertainment industry burns through is ridiculous. There are lots of things we can do to minimize, but it would be delusional to think it will ever be completely eliminated. I decided that I need to do as much positive effect as possible to help counter the negative results I have caused through the years. I feel, as always, that I am most effective when using my art, so my beast shot was using it to try to spread the word and help educate people about the environment. 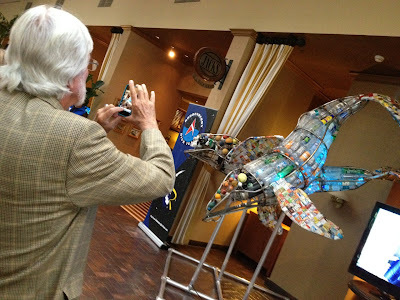 My good friend Rod Roddenberry agreed, and he was very impressed with the Surfrider sculptures. He asked me to create a piece for the Roddenberry Dive Team, an organization that promotes environmental awareness through the exploration of the oceans. Rod hosts the Trashy Diver contests, which encourages divers to clean the waterways they frequent, and rewards them for the effort. Categories include "most trash", "most unique trash", and "most likely to be found on the USS Enterprise Starship." There are tons of great prizes, like a Hawaiian vacation! 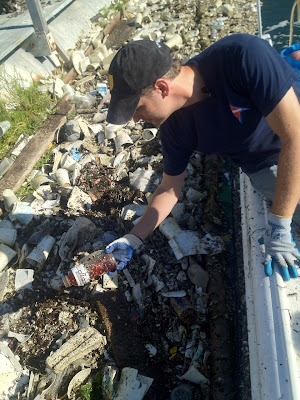 Photo 27: I participated in a multitude of the cleanups, collecting trash on the beaches, off the shore, and through the river ways all along the coast of California. With the help of an army of volunteers, we amassed truckloads of debris that I could use to create the art piece. 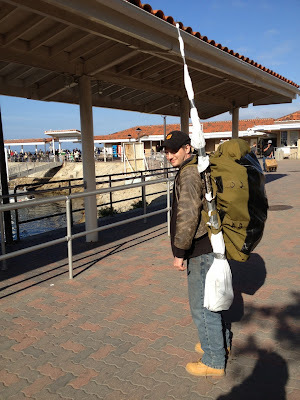 On some of the more remote trips, like Catalina Island, I was limited to the amount of trash I could use by what I could carry on my back. Soon there was a huge pile at the BarnYard, which we sorted through and categorized. The big question was, what was I going to build? 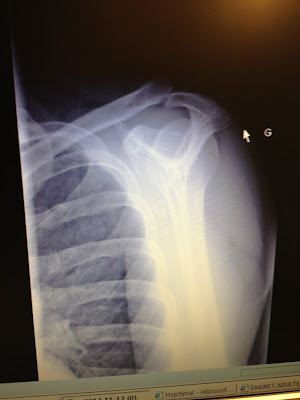 Photo 28: Rod and I spent a lot of time talking about it, and conceptually we were of two minds. I felt strongly that because so many artists were doing recycled/found object nature sculptures, we should do something Star Trek themed, since Rod is the only one who could truly represent that aspect of the sci-fi phenomenon's view of the future. Rod really wanted to do a marine animal, going for the juxtaposition of creating a beautiful image out of the materials that are destine to destroy it. In the end, we compromised, and I used the trash we pulled from the California water ways to build George and Gracie, the humpback whales from Star Trek IV: The Voyage Home . The piece premiered at the Ocean Blue Film Festival in Monterey, alongside the submersible James Cameron used to go to the deepest depths of the ocean that any man ever has. With such serious technology as that, I wasn't sure how my trash sculpture would be received. But all my fears where put to rest when explorer Jean Michel Cousteau became George and Gracie's biggest fan. 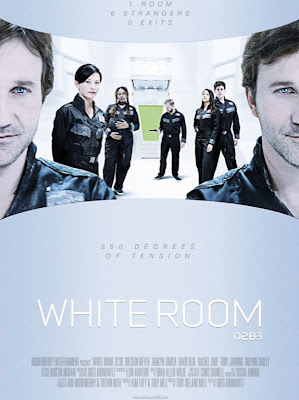 Photo 30: In 2011, I directed and designed White Room: 02B3, the first original Roddenberry Production in years. 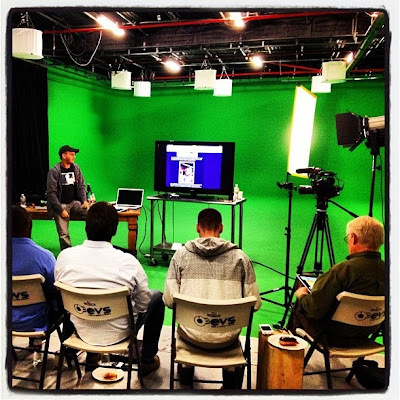 We filmed the project in 360 degrees, using state of the art technology for an audience immersive experience. This year, we showed sneak peeks of that technology at the various conventions and trade shows we attended. Photo 31: The 360 version for dome theaters and your hand held devices is still being worked on, fine tuning the technology to give you the best viewing experience possible. But the "director's cut", which I filmed in a traditional single camera format, made its world premier at the Sci-Fi London Film Festival. It was great to see it up on the big screen. I got to meet so many creative forces in the sci-fi community, and I was invited to speak about special effects and film making at The British Academy of Film and Television. Photo 32: My trips to Europe, or anywhere for that matter, are usually for work and my schedule is always too full for extensive sight seeing. This trip was no exception, as we had a packed line up of screenings and panels. 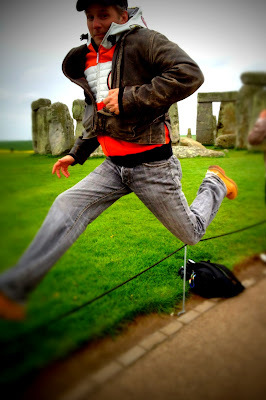 But I did finally find time to make the half day trip out to Stonehenge. It was definitely on my bucket list, but actually being there was so much more than that. It is one of those places where you can actually feel the mystery, and know that there are things in this world we will never understand. Photo 33: Then there are mystical forces that are much easier to wrap your mind around. Like the Beatles! White Room: 02B3 writer Tory Mell and I walked across London to find Abbey Road, and I was pleased to see that so little has changed since the famous photo for their 1969 album cover . When we got there, it was relatively quite. But apparently tons of people have the same idea we did, because it was soon teaming with people from all over the world. We offered to help a couple take a recreation of the Beatle's photo in exchange for one of our own, and when they screamed with joy over how perfect the one we took matched their Googled image of the original, our services became in high demand. I attempted to hold back traffic as Tory directed people to strike the pose while he snapped away. Not wanting to deny anyone, we had to wait till a lull to make our escape. We estimate we took over a hundred photos in that 45 minutes! We joked about getting a permit to set up a booth and charge $20 a pop. Surprised noone has done that yet!!! 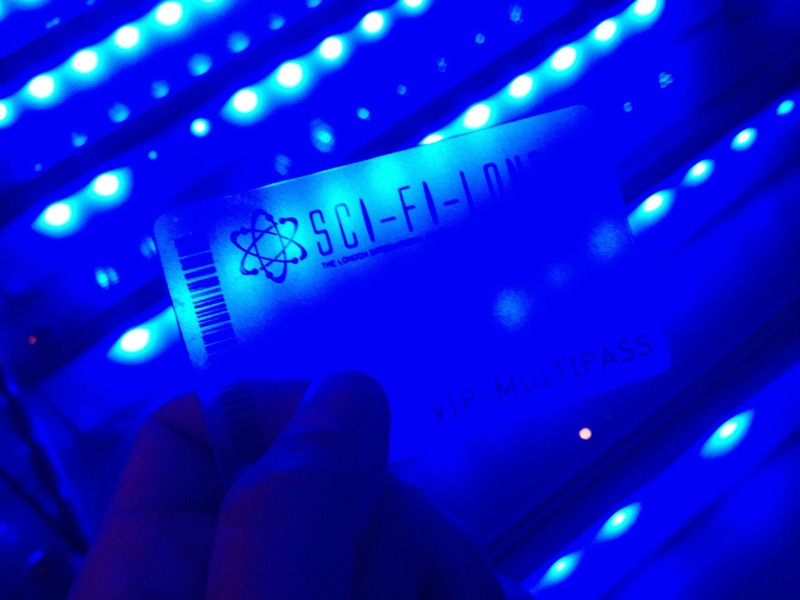 Photo 34: Hang on, I'm not done with Roddenberry yet! With Rod's help, my collectible company Floppets took a big leap forward into the licensing game when we created Star Trek Floppets! 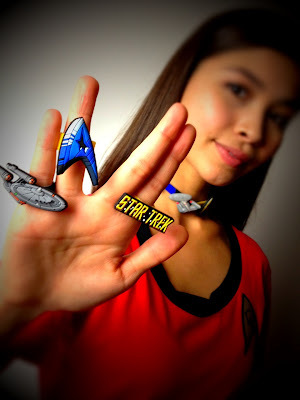 There are 9 designs available currently at Roddenberry.com, with 9 more for series 2 in production now! 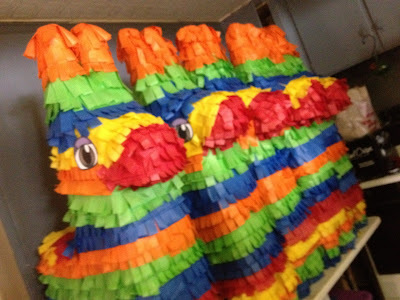 Photo 35: Floppets made leaps and bounds in 2012, which was officially its first year in business. But we came out of the gate strong, premiering at the New York Toy Fair in February, where we were called, "The next big trend in kids' toys!" It was quite the honor, considering we were on the floor with the biggest and best toy companies in the world. We wanted to make sure people didn't forget about us, so I designed these commemorative edition Floppets to hand out at our booth. 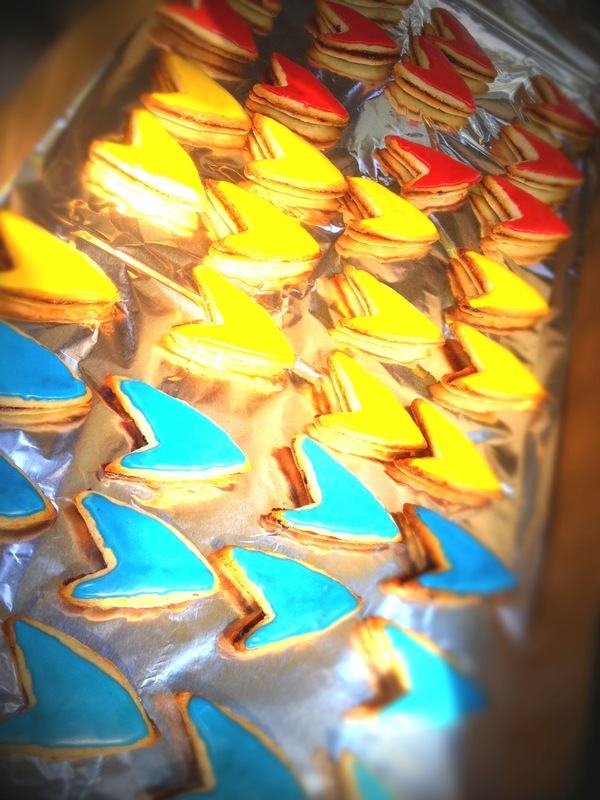 They were a huge hit, so be sure to look for a new design at every show we attend next year. And there will be a lot of them! 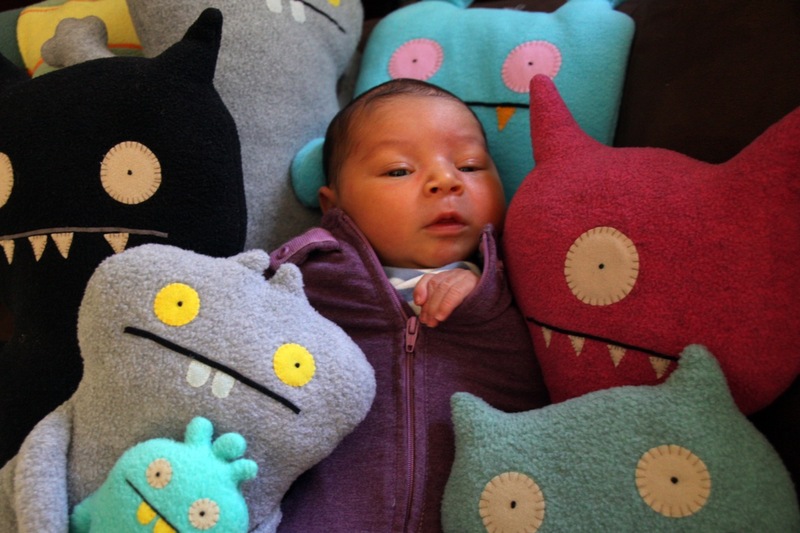 As a matter of fact, the most travel I did this past year was for Floppets. Photo 36: I attended C2E2 in Chicago, and we did a big promotion for the Guild Floppets. 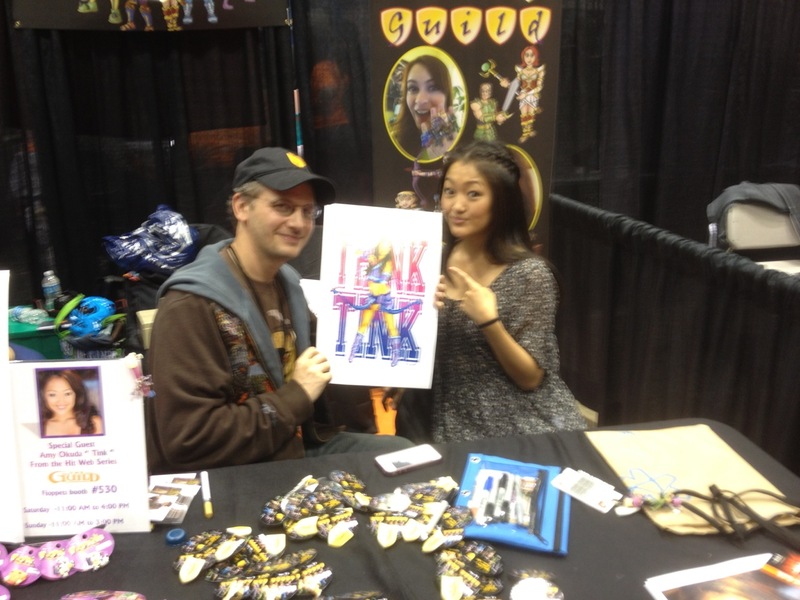 Amy Okuda was kind enough to join me for the trip, and the fans were thrilled to see her. She had a non-stop line all weekend long, and we ran out of the limited edition Think Tink prints I made by the end of the first day! Photo 37: Soon after Chicago, I ended up in Vegas again, this time for the Licensing Show. This is kind of a behind-the-scenes version of the comic conventions, because everything we know and love is represented there, but nothing is for sale and the big ticket franchises have showrooms that are invitation only. I tried to talk to Saban about some doing Power Ranger Floppets, and they wouldn't even let me in! 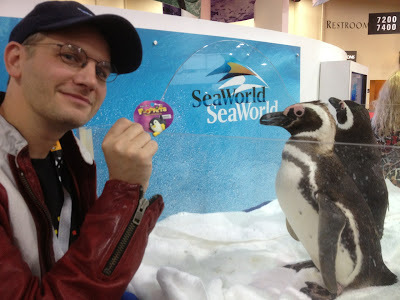 I was relieved to meet some friendly faces at SeaWorld, though. Photo 38: I ended up making a lot of great deals over the week despite my Power Rangers rejection. But I have to say that the highlight of the whole trip was running into the Gotcha booth, which was plastered with standees and larger than life photos of Marissa Cuevas! I knew she had modeled their clothing line last year, but it blew my mind to see her image representing the entire company at the show. This was just one of many achievements for Marissa in 2012, a list which also includes a starring role on Nickelodeon's Super Ninjas! I can hardly wait to see what she will accomplish in 2013! 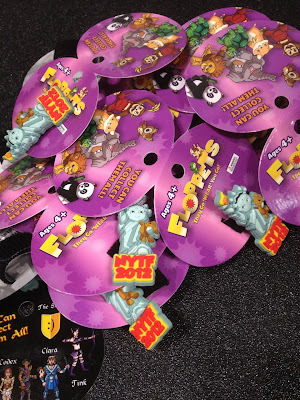 Photo 39: Floppets also had a huge presence at San Diego Comicon. We premiered Star Trek series 1, along with original designs for Witchblade, Darkness, and Fathom. We also had a ton of signings, including the entire cast of The Guild, Legend of Neil, Save the Supers, Brent Spiner's Fresh Hell, and Team Unicorn. 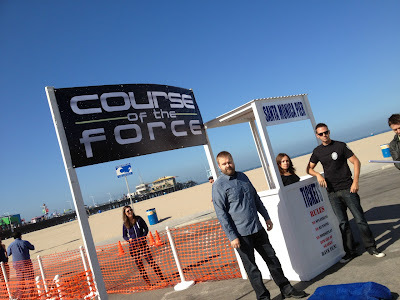 But comicon started way early for me this year, since I helped Chris Hardwick and The Nerdist Channel usher in the event with the Course of the Force. This charity run started in Santa Monica, and celebrity runners carried a lightsaber all the way to San Diego. The whole thing started with an online video of Chris getting the prop from Lucasfilm in San Fransico. I production designed the spot, and even got to cut off The Walking Dead creator Robert Kirkman's hand. Photo 40: It was nice to not have to travel far from home for Stan Lee's Comikaze. It was so close, actually, that I didn't mind packing up my studio and converting the Floppet's booth into a Web Series Museum. 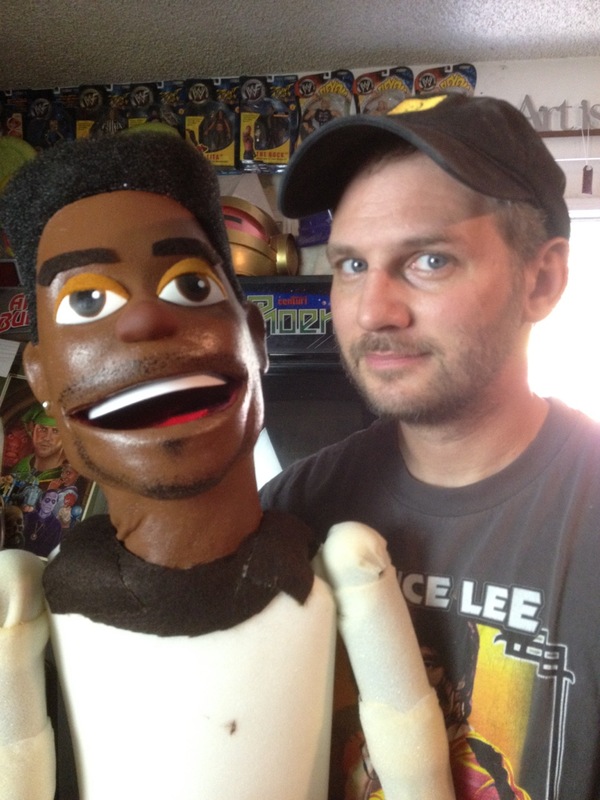 I put all the props I've made from shows I've worked on so everyone can see them live. If you dropped by at the right times, you also would have met Felicia and Team Unicorn live! 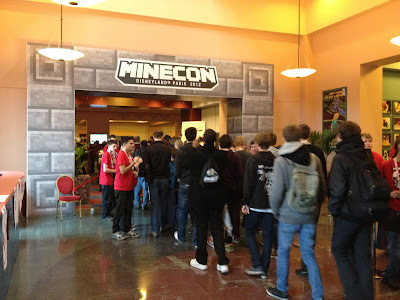 Photo 41: This was the first year I got to attend PAX. Naturally, I drifted through the floor like a zombie, since it took another string of all-nighters and insane last minute building to create The Museum of Mojang. 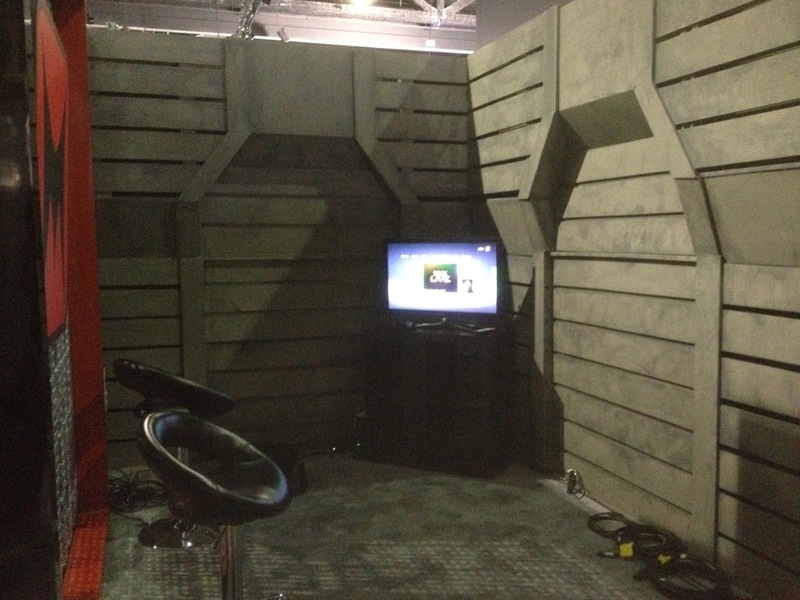 This booth housed relics and works of art from the creation of MineCraft, as well as Scrolls, and Cobalt. Everything turned out great, though, and I had a good time hanging out with the geniuses from Sweden. My "anatomy of a creeper" was a big hit, as iJustine will testify! Photo 42: I had to sneak away from filming the Guild season 6 to make an appearance at PowerMorphicon, but it was well worth it. It's always good to be reunited with my SPD rangers . Monica May, Brandon Jay McLaren, and I did a panel, had a few laughs, signed a few autographs, and then I had to bail. I can't wait until I can work with all of those guys again. 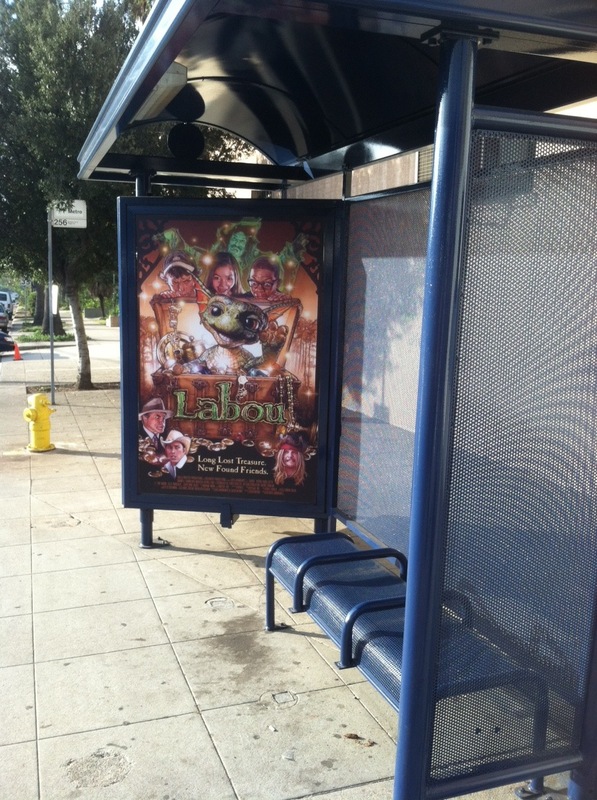 Photo 43: If you got to roam around E3 this year, you were sure to run into some of my work. My favorite piece was the Live Feed set for the Machinima booth. They wanted something that was generic, yet embodied sic-fi and gaming. I went with this Aliens inspired structure, and we tricked it out with aluminum pipes and red under lighting. Photo 45: The guys over at Sypher Art Studios jumped in to help me build the Steampunk booth for Guild season 5, so in trade I sculpted them a full size dragon head for the Labyrinth of Jareth Masquerade Ball. 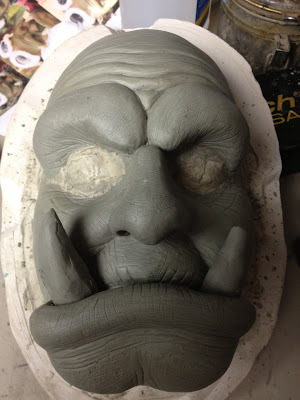 On Guild season 6, I needed to borrow said dragon back for the game designer's office, so I returned that favor with a series of goblin sculpts. I did 5 characters in all, and created 30 appliances for the 2 night event. Photo 46: I took a break in between making things to TALK about making things! I did multiple lectures and panels this year, including this fun interactive one for the Bui Brothers. Photo 47: And late at night, when I couldn't sleep, I would draw strange things to put on Apple computers! 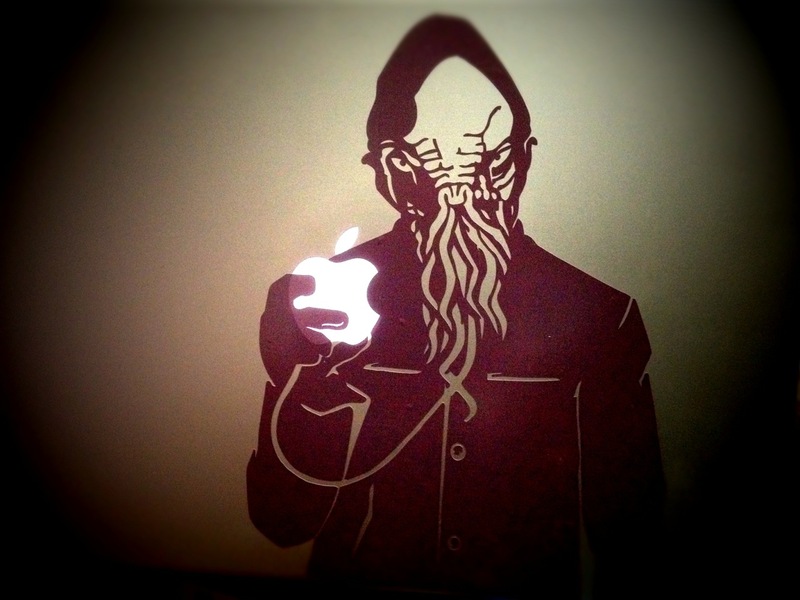 I have multiple designs available for sale on Etsy, but the most popular by far is the Ood. Photo 48: The last convention of the year was the biggest of them all. Mojang brought me back to design Minecon 2012, and this time it was in Paris. I had to travel over there several time to scout out the venues, find crew and facilities, and work out all the details since the show was so involved. 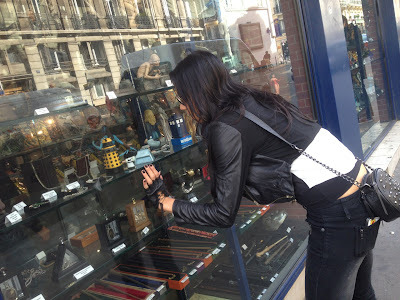 Photo 49: There definitely ended up being some downtime between scouts and meetings, and there is so much to see in Paris. I was over there with Milynn, so naturally the priority was discovering French comic book shops! Photo 50: We also went to Stockholm, Sweden to visit the Mojang offices. 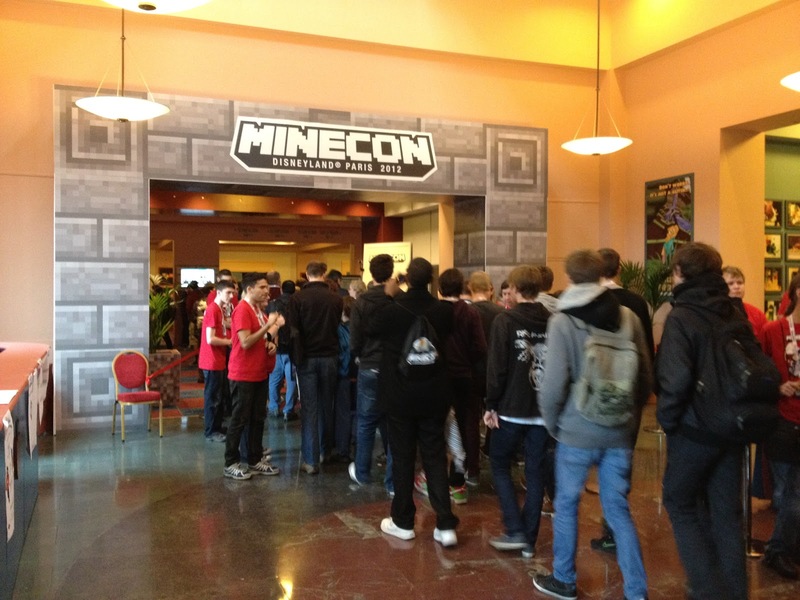 There Junkboy and I plotted and schemed about what Minecon Paris would look like. If you are wondering why this photo looks like it's from the 1920s, it's because the guys threw a big, themed office warming party the week we where there. It was an adventure finding vintage clothing in the malls of Stockholm, but I think we did alright! Photo 52: Everyone on the crew took a some damage from the incident, but here at the BarnYard, we truly believe the show must go on! 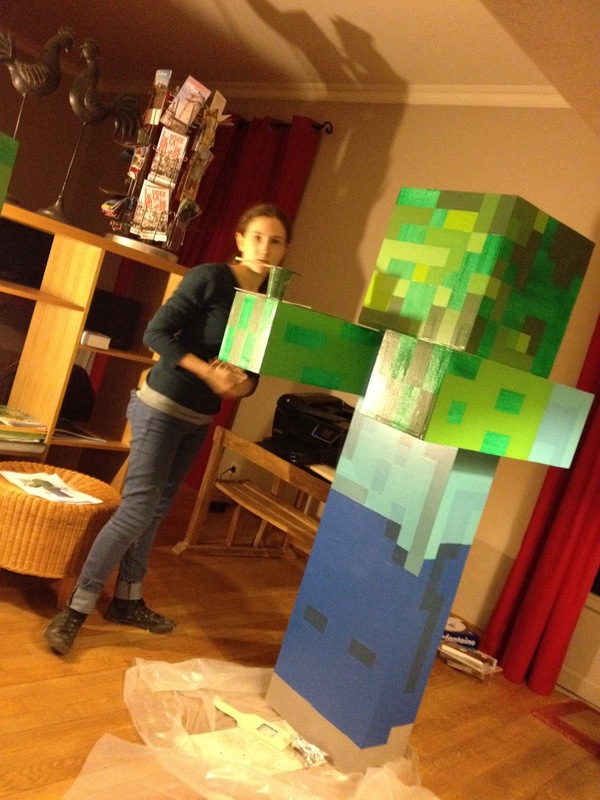 We made an oath to avoid train stations, and stayed in Paris to finish building Minecon. I have to admit that three dimensional 8-bit pixels are very surreal on morphine! I kept my distance from the power tools for a bit, and focused as much as I could on the big picture. It was a struggle for us all to get to the finish line, but I feel like at some point over that weekend, practically every one of the 7,000 attendees came up to personally thank us. That is the best medicine ever. Photo 53: In the war of art, there are no winners or losers. Everyone has there own style, methods, and audience. BUT, if I had to pick a winner, this year it would definitely be Keri Palmetto! Keri joined the BarnYard as an intern right after the holidays last January. I decided to hire her after the first project, and over the course of this year, she has worked on almost every single project I mentioned above, and most of the ones I haven't mentioned! She even survived the Paris mugging with me! All in all, about 40 unique projects in 12 months. If nothing else, 2012 gave Keri a full resume. Hopefully she is enjoying her experience at the BarnYard as much as I enjoy having her here! Happy New Year, Keri, and here's to many more (police baton free) projects! Photo 54: This past year has been filled with many wonderful things, but the most wonderful of them all was the introduction of Nikko Ransom Byrnes. His mom is my best friend, and producing partner for over a decade, Sheri Bryant. I don't know if he will grow up to think of me as an uncle, or a brother, or that weird dude that has a house full of scary heads, but holding him in my arms, I do know that no film or work of art could ever be as wonderful as he is. I am so inspired by him. He is only a few months old, but seeing him smile and laugh every time he sees his dad, John Byrnes, is the most amazing thing ever. I know that he will never be without, that his parents are the kindest and most caring people I know, but I promise that if he ever needs anything, I will be there. Everything I possess is his, and every ability I have will be used to make his dreams come true. I am so excited to share 2013 with Nikko. It is the beginning of his journey, and I'm certain it will be the best adventure yet!